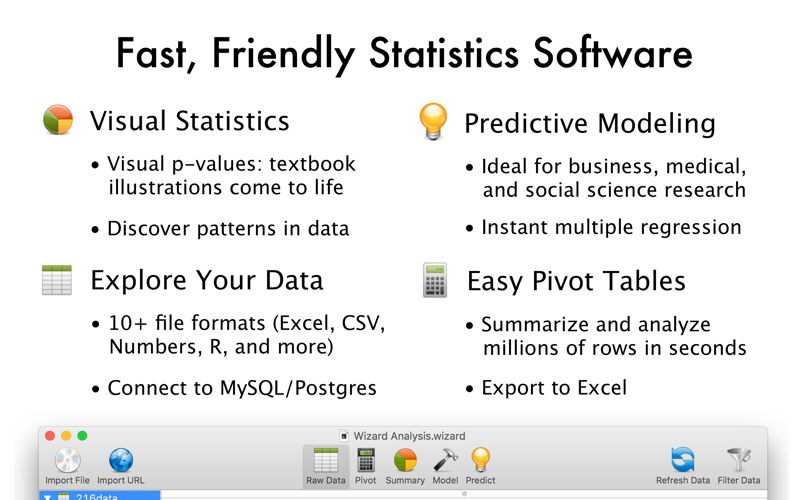 To download Wizard - Statistics & Analysis from the Mac App Store, you need a Mac with OS X 10.6.6 or later. Learn More. 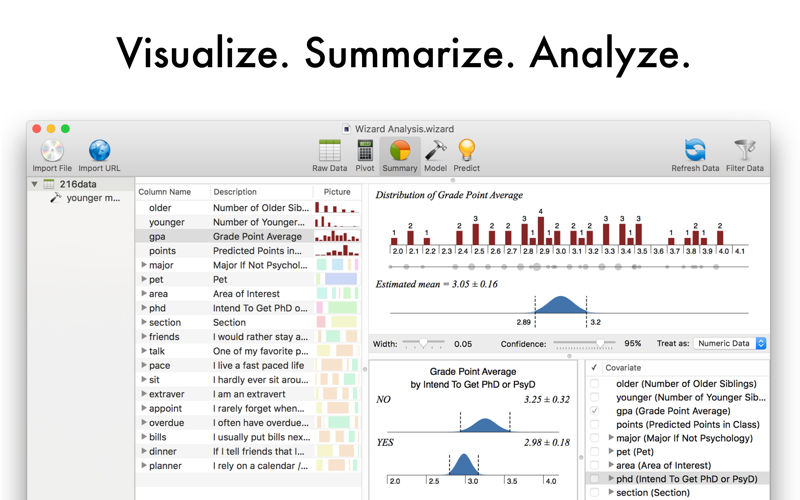 Wizard is a new Mac app that makes data analysis easier than ever. No programming, no typing — just click and explore. Wizard makes statistics accessible to beginners, but beneath the surface lies a full set of tools for doing professional research. Featured by Apple! "New and Noteworthy" and "@Work: Apps for Business"
Wizard will start graphing your data as soon as you click on it. It uses native Mac graphics to give you crisp visual summaries — box-plots, scatterplots, histograms, survival curves, and more — in a fraction of a second. 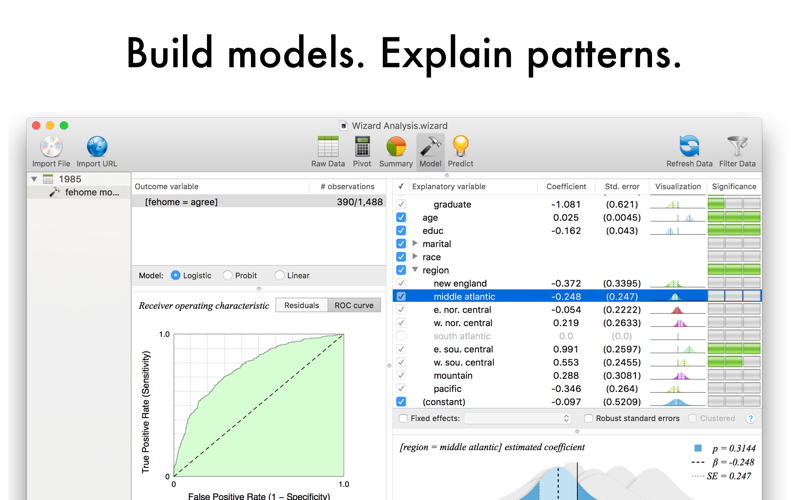 Build sophisticated statistical models in seconds with Wizard's intuitive modeling interface. Regression estimates are instantly recomputed as you play around with the controls and experiment with new specifications. 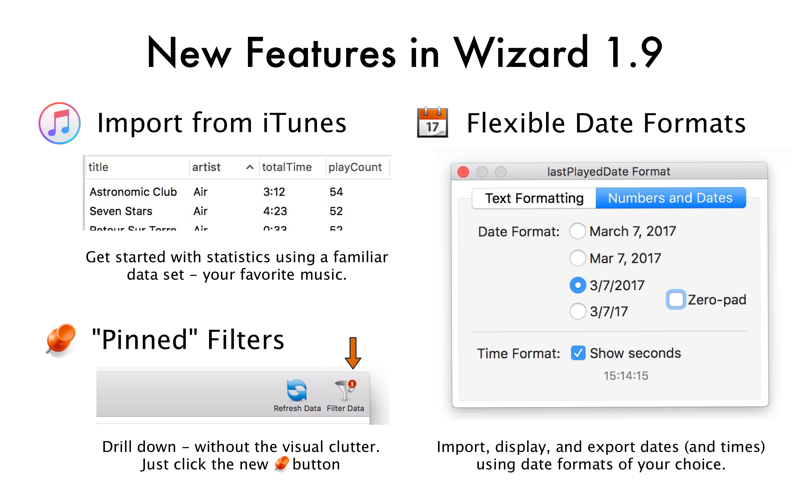 Wizard supports drag-and-drop, multi-level Undo, and other interface conveniences that Mac users expect from their software. An interactive tutorial will help you get started. Dozens of functions are available to help you get data into the form you want. Compute quantiles, perform day-of-week calculations, multiply columns together, and more. Export colorful graphics as web-friendly PNG or print-quality PDF. If you're surrounded by PC users, export your models as interactive spreadsheets that can be used to run "What if?" scenarios in any version of Microsoft Excel. Is there a missing feature you'd like to see? Just click "Email the Developer" from the Help menu and send me your thoughts. To import and export other formats, including SPSS, Stata, and SAS, you can either buy In-App Purchases inside Wizard (Wizard > Unlock Pro Features...), or purchase Wizard Pro, also available in the Mac App Store. The set of included importers is the only difference between the Pro and Standard versions. * COLLAPSIBLE FILTERS -- Make the most of screen real estate with the new Pin button -- when activated, it keeps filters applied even when you close the Filters pane. * DATES, DATES, DATES -- Import dates in your favorite format, format your dates with four exciting date templates, analyze dates with down-to-the-second precision, partition date/time data with greater flexibility, and create Timestamp columns using the number of seconds from a particular start date. * FILE SIZE FORMATTING -- Does your data set include a file size measured in bytes? Now you can format it with easy-to-read units (KB, MB, GB, etc). There's even an option to switch between the decimal convention (1,000 bytes per kilobyte) and the binary convention (1,024 bytes per kilobyte). 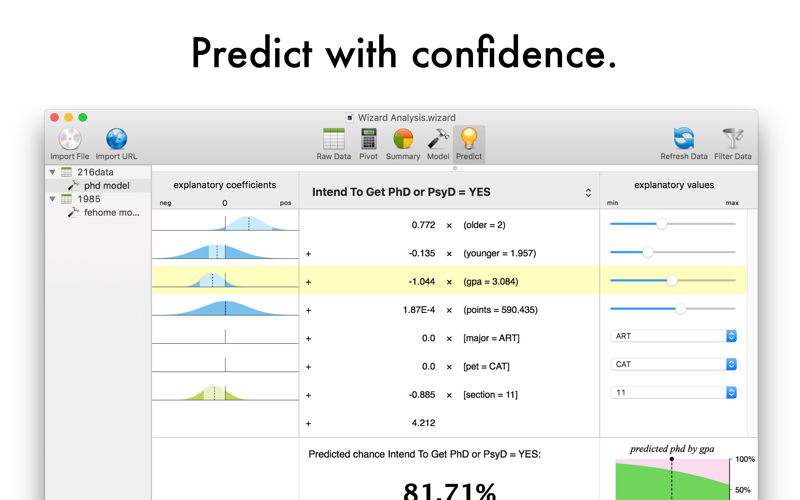 * NEW PIVOT FUNCTIONS -- Standard Error of the Mean and 95% Confidence Interval, now available for your pivoting pleasure. These are just the big-ticket items -- in addition, Wizard 1.9 boasts countless interface tweaks and bug fixes to make your statistical experience as smooth, seamless, and streamlined as possible. Enjoy it on OS X 10.10 (Yosemite) or later.